A breakfast classic! Five thick slices of hand-dipped French toast, topped with whipped cream and powdered sugar. 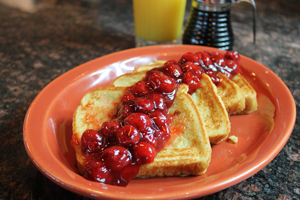 It’s the best of both worlds- five sweet slices of French toast and your choice of a savory side. Choose from a full order of four bacon strips, or a full order of three sausage links, or one slice of ham. Topped with whipped cream and powdered sugar. Five slices of French toast with your choice of apple compote, or cherry compote, or strawberry compote, or blueberry compote, or banana slices, or pecan bits, or sweet cream cheese topping. 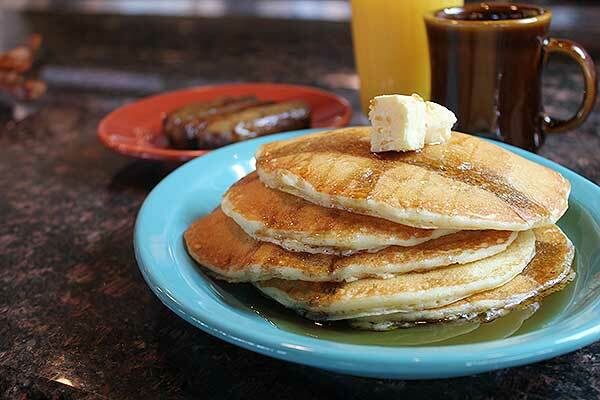 Five buttermilk pancakes with your choice of apple compote, or cherry compote, or strawberry compote, or blueberry compote, or banana slices, or pecan bits, or chocolate chips, or sweet cream cheese topping. Five fluffy pancakes served with a full order of four bacon strips, or three full sausage links, or one slice of ham. 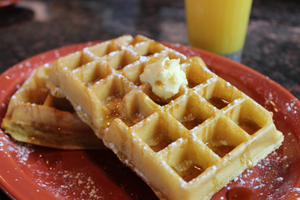 Our classic Belgian waffle topped with whipped cream and powdered sugar. One whole Belgian waffle with your choice of five chicken wings, or one fried boneless chicken breast, or three chicken fingers. One full Belgian waffle topped with whipped cream and powdered sugar, with your choice of four bacons strips, or three sausage links, or one slice of ham. One full Belgian waffle with your choice of apple compote, or cherry compote, or strawberry compote, or blueberry compote, or banana slices, or pecan bits, or chocolate chips, or sweet cream cheese topping. One whole Belgian waffle with three chicken fingers tossed in our spicy honey sauce. Three biscuits with two sausage patties and covered with our homemade sausage gravy. 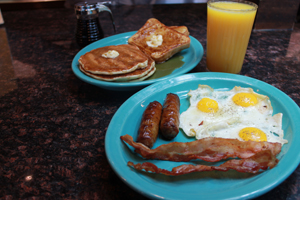 Served with your choice of three eggs, cooked any style. Three eggs, cooked any style, served with three biscuits and gravy. Four buttered biscuits covered in our sausage gravy. Four buttered biscuits, covered in our sausage gravy and topped with bacon bits and shredded cheddar cheese. Four buttered biscuits covered with our sausage gravy and served with your choice of four bacon strips, or three sausage links, or one slice of ham. Four of our homemade French crepes topped with whipped cream and powdered sugar. Four crepes with your choice of apple compote, or cherry compote, or strawberry compote, or blueberry compote, or banana slices, or pecan bits, or sweet cream cheese topping. 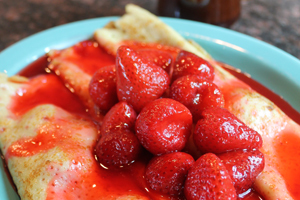 Cottage cheese in four crepes, with your choice of apple compote, or cherry compote or strawberry compote. 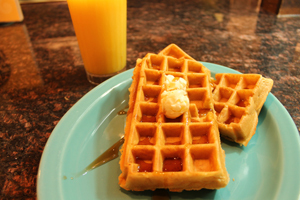 This sweet and savory breakfast will hit the spot! Four crepes topped with whipped cream and powdered sugar, served with your choice of a full order of four bacon strips, or a full order of three sausage links, or one slice of ham. 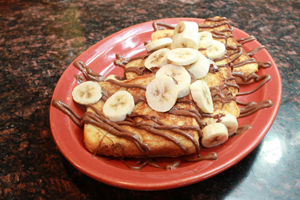 Five slices of French Toast topped with Nutella and slices of bananas and topped with whipped cream and powdered sugar. Four soft French crepes stuffed with Nutella and slices of bananas and topped with whipped cream and powdered sugar. Five fluffy pancakes layered with Nutella and slices of bananas and topped with whipped cream and powdered sugar. One whole Belgian waffle covered in Nutella and slices of bananas and topped with whipped cream and powdered sugar. Start the day with our RTC classic omelette filled with chopped ham, diced tomatoes, green pepper and onions and two slices of American cheese. Our famous five-egg omelette filled with sauteed mushroom, diced tomato, green pepper, and onion, stuffed with two slices of mozzarella cheese. Savory bacon, chopped and stuffed into our five-egg omelette, with diced tomato, green pepper, onion, and two slices of American cheese. 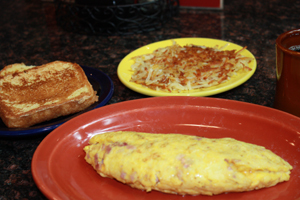 Two slices of American cheese with chopped sausage, diced tomato, green pepper, and onion, all in our five-egg omelette. Made with fresh spinach leaves, sliced mushrooms, diced tomato, green pepper and onion. Filled with chopped ham, mushroom, onion, tomato, green pepper and two slices of American cheese. 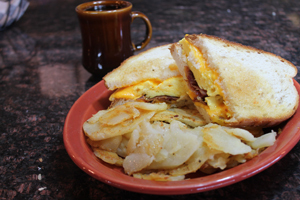 This hearty omelette features chopped bacon, sausage, and ham mixed in with two slices of American cheese. Our five-egg omelette filled with chopped turkey bacon, turkey sausage, diced tomato, green pepper, onion and finished with two slices of Swiss cheese. Chorizo meat, onion, tomato, green pepper, chopped jalapeno and shredded cheddar cheese fill this generous-sized omelette. Our home-style omelette is filled with chopped sausage, diced tomato, green pepper, onion, and shredded cheddar, all covered with our sausage gravy. Stuffed with pieces of grilled chicken breast and diced bacon, and stuffed with two slices of pepperjack cheese. Chopped, juicy skirt steak, tomato, green pepper, onion and two slices of American cheese. Diced Bacon, mushroom, and two slices of pepperjack cheese in our five egg omelette. Eggs whites, spinach leaves and mozzarella cheese. Served with a side of fruit and your choice of toast. 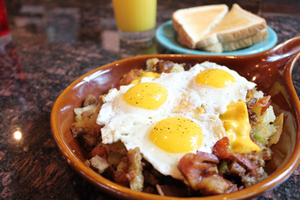 Bacon mixed into a skillet with diced tomato, green pepper and onion, topped with two slices of American cheese, three eggs, any style, all over American potatoes. Made with fresh spinach leaves, onion, green pepper, mushroom, diced tomato, American cheese and three eggs, any style, served over American potatoes. Gyro meat, onion, diced tomato, green pepper, potatoes, feta cheese and three eggs, any style, served over American potatoes. Chorizo meat mixed with chopped jalapeno, diced tomato, and onion, topped with shredded cheddar cheese and three eggs, any style, all over American potatoes. Chopped bacon, sausage, and ham mixed with diced tomato, green pepper and onion, topped with two slices of American cheese and three eggs, any style, all over American potatoes. Diced turkey bacon and turkey sausage mixed with diced tomato, green pepper and onions finished with two slices of Swiss cheese, three eggs, any style, all over American potatoes. A hearty skillet filled with chopped sausage, diced tomato, green pepper, onion and two slices of American cheese and three eggs, any style, all over American potatoes. Chopped sausage, diced tomato, green pepper, onion and shredded cheddar cheese, all topped with sausage gravy and three eggs, any style, over American potatoes. One whole country fried steak, diced tomato, green pepper and onion, with shredded cheddar cheese all covered in sausage gravy. Served with three eggs, any style, over American potatoes. Our juicy skirt steak chopped up and mixed with diced tomato, green pepper and onion, finished with two slices of American cheese with three eggs, any style, over American potatoes. Classic corned beef hash, onion, tomato, and green pepper topped with two slices of American cheese. Finished with three eggs, any style, served over American potatoes. Grilled chicken and diced bacon mixed with tomato, green pepper, and onion, topped with two slices of pepperjack cheese, served over American potatoes. American cheese, Swiss cheese, cheddar cheese and mozzarella cheese with green pepper, onion, tomato, and four eggs, all scrambled together with hash browns. Classic corned beef hash, onion, tomato and green pepper topped with two slices of American cheese. Scrambled together with hash browns and four eggs. Spinach leaves, green pepper, onion, tomato, mushroom, four eggs and American cheese all scrambled together with hash browns. Chopped bacon, sausage and ham with onion, tomato and green pepper topped with two slices of American cheese, mixed with four eggs and hash browns. Chorizo meat mixed with chopped jalapeno, onion, tomato, four eggs and American cheese, all scrambled together with hash browns. Skirt steak served with three eggs. Two center-cut pork chops served with three eggs, cooked any style. Please allow 20 minutes. 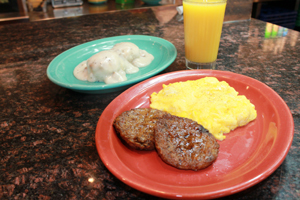 A country fried steak topped with sausage gravy, served with three eggs cooked any style. 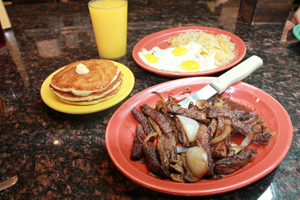 Cut skirt steak strips with grilled onion and grilled mushroom, served with three eggs, cooked any style. New York strip steak served with three eggs, cooked any style. Pick any one breakfast side. 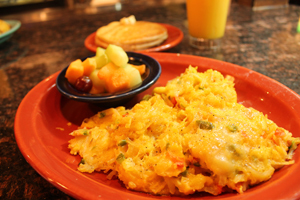 Diced ham and cheddar cheese, stuffed with hash browns and eggs scrambled with green pepper, onion and tomato. Served in a large tortilla wrap. Pepperjack cheese, cheddar cheese, and jalapenos, stuffed with hash browns and eggs scrambled with green pepper, onion, and tomato. Served in a large tortilla wrap. Chorizo meat and cheddar cheese, stuffed with hash browns and eggs scrambled with jalapeno, onion and a tomato in a large tortilla wrap. Diced bacon and cheddar cheese, stuffed with hash browns and eggs scrambled with green pepper, onion and tomato. Served in a large tortilla wrap. Diced sausage and cheddar cheese, stuffed with hash browns and eggs scrambled with green pepper, onion and tomato. Served in a large tortilla wrap. The following a la carte sides are not included as our complimentary breakfast sides.